He knew way back then that the foods we eat either heal or harm our bodies (So how come so many modern physicians are still not up-to-speed on this idea?). One of the foods he used to prescribe to his patients to treat myriad medical conditions was garlic. That’s right, good ol’ stinky garlic. It turns out garlic is not only incredibly delicious but also very good for us, and modern science has recently confirmed many of these health benefits. Garlic is part of the Allium (onion) family, which contain a lot of sulfur compounds that are beneficial to our health. These sulfur compounds are what make onions and garlic have such strong, distinct odors. One particular sulfur compound in garlic is called allicin, and studies have shown allicin has the ability to lower LDL cholesterol (the lousy kind), increase our HDL cholesterol (the Heavenly kind) and promote overall health of the circulatory system. This means garlic may potentially aid in the prevention of heart attacks and strokes. 23% of the RDA of Manganese. 17% of the RDA of Vitamin B6. 15% of the RDA of Vitamin C.
6% of the RDA of Selenium. And also some Calcium, Copper, Potassium, Phosphorus, Iron and Vitamin B1. Garlic has been shown to support our immune system. In fact, one study found that supplementing with garlic daily reduced the number of colds by 63%. The average length of cold symptoms was also reduced from 5 days in the placebo group to just 1.5 days in the garlic group. The bottom line is, garlic will keep those colds away this winter. Sure your breath may stink a bit more, but at least you won’t be coughing on people. One of the biggest things that contributes to the aging process is the damage from free radicals. 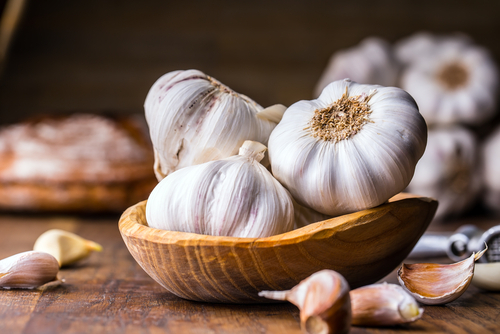 By now we all know that getting enough antioxidants into our diet is important to fight these free radicals, but did you know that garlic contains a significant amount of powerful antioxidants? Studies have shown supplementing with high doses of garlic significantly reduces oxidative stress in the body, which may help prevent brain disease like Alzheimer’s and dementia. In fact, garlic is just one of many ways to bulletproof your brain and gain back your quick, sharp, witty mind you had as a young adult. Go here to watch a fascinating presentation showing you why mental decline happens and what you can do TODAY to reverse it. Besides fighting off the common cold, garlic fights off both viral and bacterial infections. In fact, garlic is a natural antibiotic that, unlike other antibiotics, does not appear to create resistant bacteria strains. Garlic doesn’t just stimulate the immune system, it specifically stimulates our white blood cells and T-cells. Garlic is particularly good at treating upper respiratory viral infections as well as strep, staph, and even anthrax bacteria. The effects of heavy metals on your health are well-documented and, quite frankly, scary. This is especially apparent in regards to your mental health. And if you’ve been noticing a decline in your mental performance lately, heavy metals may be to blame. There are many ways to boost your mental cognition, such as the secrets discussed in this presentation. One of them is garlic. Studies have found high doses of sulfur compounds found in garlic can detoxify the body of these heavy metals. One particularly interesting study looked at employees of a car battery plant that had excessive exposure to lead. After four weeks of taking a garlic supplement, lead levels were reduced in their body by 19%. This eliminated the clinical signs of toxicity such as blood pressure issues and headaches. Three doses of garlic each day was found to outperform the drug D-penicillamine in symptom reduction of heavy metal toxicity. Although human studies have not been conducted on the effects of garlic on bone health, rodent studies have shown that garlic supplementation increases estrogen in female rats thereby minimizing bone loss. A study conducted on menopausal women found that a daily dose of garlic extract significantly decreased a marker of estrogen deficiency. These findings suggest that garlic may indeed have beneficial effects on bone health in women. Sure you can take a garlic supplement, but why not try to eat more of the real stuff because it is so insanely delicious. Nowadays you can buy regular garlic cloves, but you can also buy it already chopped up for you, as well as in paste and powder form. Garlic complements pretty much every savory dish, at least in my humble opinion, and it’s easy to add to soups, sauces, and salad dressings. Try adding garlic and onions to an omelet or to an aioli sauce (kind of like mayo) which you can then spread on sandwiches and anything else you can think of. There are a few things to consider when adding more garlic to your diet – first, there’s your breath. It will stink, so be sure to keep some mints or chewing gum handy. Second, if you are taking any blood thinners or have a bleeding disorder, speak to your doctor before increasing your garlic consumption. And one final word on garlic, you will get the most health benefits if you crush and eat garlic when it is raw. So leave it out until the last minute when you can quickly stir it into your recipes, or crush it and sprinkle it on top of your dishes.